Long term goals seem so daunting don’t they? When you’re starting from zero paying off $30,000 in debt or saving $500,000 for retirement can seem downright impossible. And not only that, but some long term goals, like saving for retirement or your child’s college education, are just boring. (Tell me I’m not the only one who feels this way!) These goals are important, yes. But unless you’re fast tracking your way to an early retirement, putting smaller amounts of money back doesn’t leave that feeling of excitement. This lack of motivation and feeling of overwhelm is probably why it’s so hard to gain momentum. However, if you’re aware of the reasons why you have a hard time accomplishing these types of goals and need some extra motivation, I think these tips will help. While there are so many goals I’d love to pursue, the truth is I can’t do everything and I’m sure you can’t either. You need to work with the budget you have, stop comparing your situation to that of others, and figure out what goals are going to benefit your life the most. I personally despise debt. (Truth be told I hate all types of monthly payments and secretly wish I could pay my utility bills a year at a time!) The only debt I have is a mortgage and that mortgage really bothers me. My mortgage is my biggest expense and without it I would be able to live on a very nominal amount of money, which makes paying off the mortgage a big goal for me. Not having a mortgage will bring me a bigger sense of financial stability than having an extra $100,000 in a retirement account would. That might not be the same case for you. And that is perfectly fine. With the exception of building an emergency fund and paying off consumer debt, ditch any preconceived notions on what you should be doing and by all means, forget what other people are doing. Think long and hard about what would make your life better. What’s going to move you closer to financial stability for your unique situation? We all live different lives so normal cookie-cutter, one size fits all advice doesn’t really work. You’re the only person who truly knows what will make your life better. Once you figure out the things that you need to do, prioritize. You’re not going to be able to tackle every single thing you’d like to do all at once (and neither am I.) Pick the most important. One of the reason it’s hard to stay focused on long term goals is that they’re usually so big that it doesn’t feel like you’re making a dent in them. Throwing an extra $200/month at $30,000 of debt feels like you’re throwing a pebble into an ocean, right? So stop looking at it that way! Instead of focusing on that entire number focus on what you can do this year, this quarter or this month. I had to use this method for my goal of mortgage pay-off. Putting $10,000 on a $110,000 mortgage seemed liked nothing, even though $10,000 is a big amount of money to me. Instead, I had to reframe my goal. My goal turned into putting an extra $20,000 on my mortgage in 2016. (Which is a stretch, by the way.) Now when I pay an extra $10,000 I’m halfway to my goal for the year. That’s exciting!! Reframe all of your big goals into goals for the upcoming year. Don’t look at the huge number, look at what you can do to reach your yearly goal. That will keep you so much more motivated and excited about the progress you’re making. I’ve already mentioned that saving for retirement and for my kid’s college education doesn’t really excite me. It’s something I know I need to do and that I absolutely want to do, but it’s not a goal that keeps me up at night. When it comes to these goals my willpower is low, so I automate them. These goals come off the top of my budget. I don’t have to think about them. After that I set up a small amount ($50/month) to go into each of my girls’ college savings account. If you’re like me and have goals that you really want to make progress on but just aren’t lighting a fire underneath you, then you need to automate them. It’s better to have them running in the background than to not get started on them at all. Do what you can. There are so many different places where you can start retirement accounts with as little as $10/month. Figure out what you can do and then do it. If you’re really committed to making progress on those long term goals this year you need to continually monitor your progress. Check in on your balances, go over your budget, and keep funneling small amounts of money toward your goals whenever possible. If you don’t make a habit of monitoring your progress it won’t be long before you completely forget about your goals. To give you a sense of how this all works for me, here’s what I do. My three main long-term saving goals are 1) paying off my mortgage in eight years or less 2) saving for retirement and 3) saving for my kids’ college education. For 2016 my goal is to pay an extra $20,000 in principal on my mortgage. This goal is a stretch but should be doable if I really work at it. I’m also looking at whether it makes sense to refinance my mortgage to save money. My retirement contributions are automated although the contributions still need to be raised. Every two months I’ll up the contributions by $20 and by October I’ll be at my goal. I save $50/month each for my two daughters’ college savings. Unless something changes I’ll probably just leave this where it’s at for now. 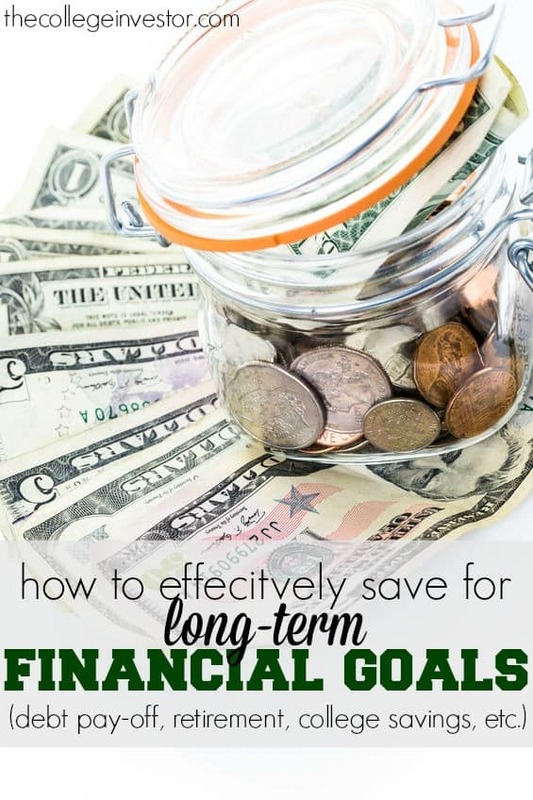 If you have trouble sticking with long term savings goals the single best thing you can do is break that goal down into smaller goals. 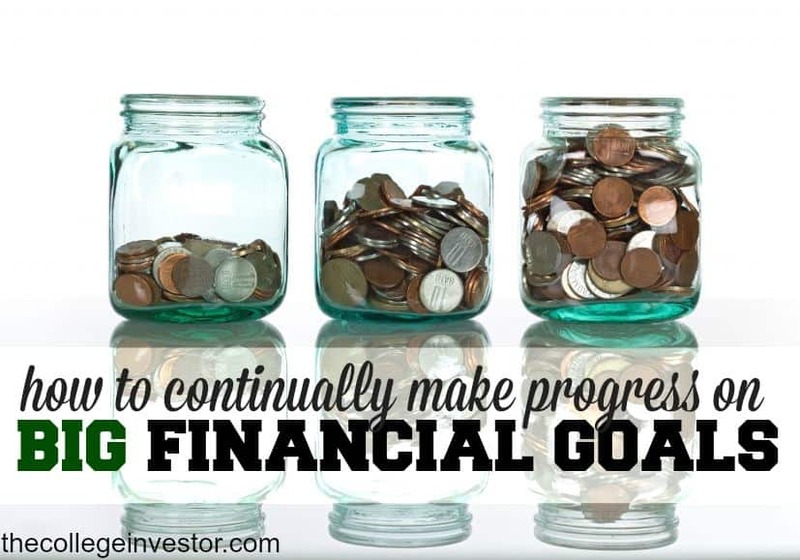 By reframing your goals into smaller amounts and shorter time periods you’ll benefit from the sense of satisfaction that comes with making progress toward the things that will really benefit you and your family. 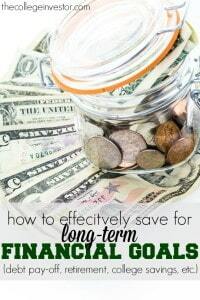 How do you stay motivated to work on long term savings goals?